Ironic, the title of the episode, isn't it? Nashville Season 4 Episode 21, the series finale, found families reuniting, Layla served her comeuppance, Will speaking out loud and proud, and all of the characters showing just how far they've come. Nashville Photos from "Maybe You'll Appreciate Me Someday"
If that's the end, I can live with that. Besides that killer cliffhanger, the characters found the peace they've been looking for all this time. It's a shame that in Nashville's final bow they decided to write the best episode they've ever had, something we should've seen much earlier in the series. Layla outed Juliette for her role in Jeff's death, throwing Juliette's life into chaos. But Juliette has a dedicated PR team that can clean up almost anything, and this is no different. Even after Jeff's sister publicly announced that she would sue Juliette for wrongful death, and that she found an eyewitness (Colt), they still manage to have her retract her statement for a settlement. Layla threw that information out to the press, much like she tipped off the paparazzi to taking her and Avery's picture, and later, she leaked Colt's name to Jeff's sister to provide her proof of Juliette's misconduct. Even though Layla managed to stay on top by hitting her best album sales and getting into the Top 100, she lost Avery, Glenn, and everyone that was helping her. Her vendetta against Juliette led to her own self-destruction, and I wouldn't have it any other way. They wrote themselves into a corner with Layla by having her come back set on revenge. Juliette shocked everyone by showing the most character development on this show. Her team cleaned up the mess. Juliette was in the clear. But her conscience isn't. Whatever. If it was her, I can't blame her. I am responsible for Jeff's death. Permalink: Whatever. If it was her, I can't blame her. I am responsible for Jeff's death. Instead of attending the Oscars, Juliette does an exclusive interview admitting her role in Jeff's death and the aftermath, pronouncing Jeff Fordham as a hero to give his family and friends some comfort. This could ruin her, and she did it anyway. She put honesty, helping people, and being a decent person, above herself and her career. And with Avery not with Layla anymore, Juliette and Avery started to reconnect, but they'll never be able to. The nasty cliffhanger we were left with was Juliette's plane going missing, sending a distress call from outside of Nashville. She never landed. Would she have ever landed? Probably not. This would've been the perfect swan song for Juliette Barnes, so maybe it's a good thing Nashville is ending. She finally accepted her role in her life. She finally took responsibility for her actions, even the terrible ones that could ruin her life. She finally grew up and stopped acting like her mother. Juliette is the Princess of Country, the show wouldn't have ever been the same without her, but this would've been the perfect way to write her off. As everyone knows, Hayden Panettiere, who plays Juliette, took a hiatus from the show to work on her own postpartum depression. Eerily like her characters. Recently, Panettiere re-entered treatment after Nashville finished shooting. Writing her character off of the show permanently would've given her time to adequately address this without having the pressure to come back to the show looming over her, and given her time to spend with her own child. With Juliette gone, there goes Nashville. It is an ensemble cast, yes, but it all started with Rayna and Juliette. That was supposed to be me. I wanted to jump. Permalink: That was supposed to be me. I wanted to jump. Meanwhile, Scarlett confesses her love to Gunnar, catching him off-guard as he returns from a trip with Autumn, the devil in a country singer's body. I realized that I'm in love with you, Gunnar. Permalink: I realized that I'm in love with you, Gunnar. Autumn, manipulating Gunnar, makes him think that Scarlett is manipulating him, and his man brain is too little to comprehend that he's being played and has been for quite some time. And after some more unnecessary, soapy drama, Scarlett and Gunnar have a steamy make out session in the middle of a concert. The Exes are exes no more. These two have always been written to be together, and they were thrown roadblock after roadblock, but they finally did it. How would this affect the band? That probably would've been the direction their story took had Nashville been renewed, but fans of the couple can rest easy because they reunited and that's the end of their story. Will. My beloved child, Will, who has grown into a proud, out, accepting, hunky man that exuberates kindness, even after all he's been through. Even with Cynthia Davis spilling nonsense about the "domestic terrorism that is his homosexual agenda." Really? Domestic terrorism? First, watching her whine about her heterosexual rights bored me to tears and I had to pause repeatedly to recompose myself before watching this ignorant character vomit nonsensical words of fear. Second, watching Will fight so hard to get onto her show to be open and honest about his feelings and who he is was his Juliette moment. His character development. From the guy that kissed Gunnar and jumped in front of a train, correct me if I'm wrong, because he couldn't accept being gay, to this? Will Lexington is one of the few things this show always had and should've used more, but when they did, it was magic. He got his happy ending, too. With Kevin, too, which is great. Kyle Dean Massey is outstanding. And Will deserved a happy ending. Luke's journey ended with him returning home to see his ex-wife, who recently split with her man, and his... daughter? Did anyone else not know that Luke had another kid? He fought so hard for Juliette, for Colt, for his career, for Will, it was time that Luke focus on himself and bettering his personal life. He hasn't had one since he and Rayna split, which was so long ago. Luke surprisingly made it to the finale when he was originally just supposed to be another obstacle for Rayna and Deacon. This show has made remarkable stories about the fight for gay rights and postpartum depression, but in this episode they tackled something else. When Maddie connects with a producer that Rayna worked with when she was that age, it sparks something in her: worry. See, this producer forced himself onto Rayna, insinuating that if she wanted to get ahead in the business, that was what she would have to do. Rayna was not going to let that happen to her daughter, and when the record label dismissed it because it happens all the time, Rayna make a risky move. To reach Maddie, she wrote a letter that the Huffington Post published, explaining what was done to her and what she wanted to protect Maddie from all along. She called out this producer for sexual assault on the internet, effectively ruining his career. He still tries, of course, but Deacon can't shake his hot-headed ways and shows up to make sure his daughter is okay, saving her from this predator. We all knew it would happen, but thankfully they brought Maddie home. At 16, we all thought we were adults and wanted to take on the real world, but the real world is really messed up. Maddie had to learn the hard way, because when you grow up entitled, that's the only way to learn. Nashville's series finale brought together families, old flames, and saw the downfall of those who deserved it. Sadly, we may never know what's next for these characters. We may never know if Juliette's plane will safely land, or if Avery and Cadence are left on their own. Or if Layla will redeem herself for being so insane and manipulative. You had a good ride, Nashville. It's time for the curtain call, now. 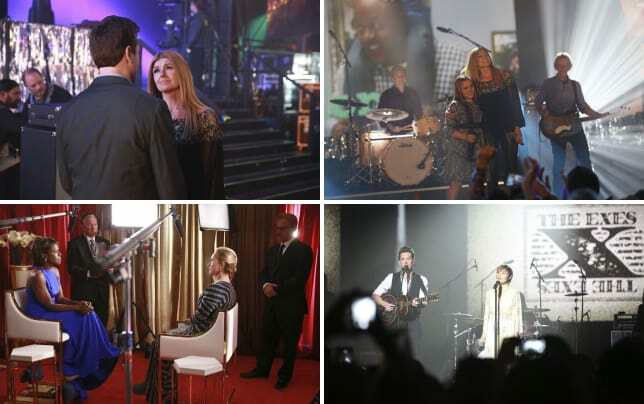 You can always watch Nashville online right here at TV Fanatic to relive the magic that brought this city to life. Were you satisfied with the series finale, why or why not? Let us know below! And make sure to tweet "#BringBackNashville" as Lionsgate (@LionsgateTV) attempts to sell Nashville to another network! Keep talking about it! Juliette is the mother of my daughter, she's always gonna be in our lives. Permalink: Juliette is the mother of my daughter, she's always gonna be in our lives. Why can't they just give out the damn award already? Why do they have to throw so many parties? Permalink: Why can't they just give out the damn award already? Why do they have to throw so many parties? Nashville Series Finale Review: A Fond Farewell?